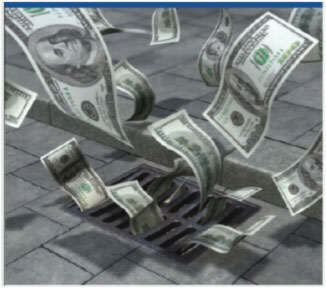 The typical medium-sized manufacturing or processing plant spends $40,000-200,000 per year on sewer surcharges. Large generators of wastewater can justify expensive, high-maintenance equipment and dedicated, specialized on-site personnel. On the other hand, smaller facilities typically discharge their non-hazardous wastewater directly to the sewer and pay an over-strength or sewer surcharge. • Complex machines based on gravity settling, DAF, or membrane filtration involve high cost and inconsistent performance. • The expense of high pressure pumps, chemical dosing equipment, nozzles, membranes…not to mention the costs of on-site expertise, chemicals, and solids handling are prohibitive. • Inefficient processes and inconsistent performance typically result in lower savings from surcharges, while introducing another level of operational complexity. Until now, there were no cost-effective or practical alternatives for smaller companies to avoid sewer surcharges. In 2014, a typical Midwestern meat processor discharged an average of 280,000 gallons per day of wastewater into the city sewer averaging 3,000 lbs of pollutants per day. The city charged 18¢ and 29¢ for every pound of two key pollutants resulting in a total annual sewer surcharge bill of $158,840. © 2019 Mikroflot. All rights reserved.